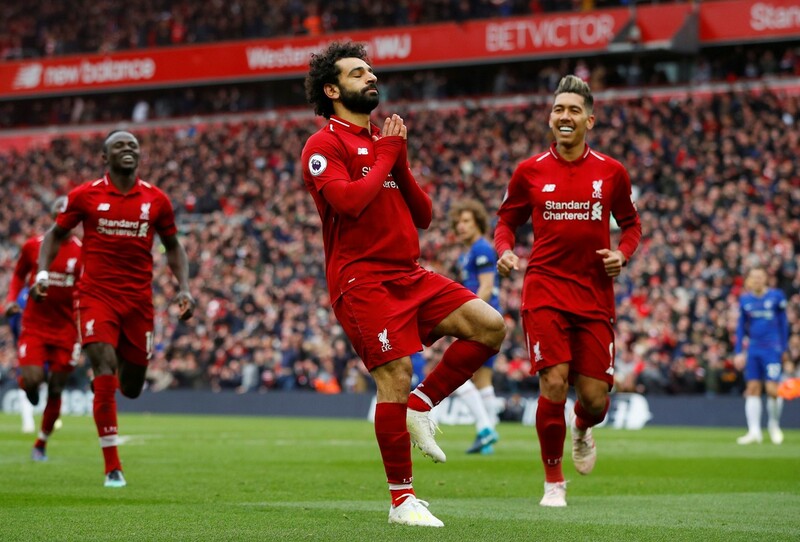 Liverpool star Mohamed Salah struck a stunning goal in his team’s crunch Premier League clash against Chelsea, following a week in which fans of the London club were reportedly filmed racially abusing him. Salah cut in from the right on the edge of the box and fired off an unstoppable left-footed shot past Kepa Arrizabalaga and into the top corner on 53 minutes at Anfield on Sunday, handing Liverpool a 2-0 lead after Sadio Mane had broken the deadlock just two minutes earlier. It was an incredible strike from the Egyptian that will be a goal of the season contender, and he celebrated by cupping his hands to his ears as well as striking a ‘zen’ pose in front of fans. Salah’s goal against his former club comes after a group of Chelsea fans were allegedly filmed making racist chants about the forward during the Blues’ Europa League trip to Prague earlier this week. The group were reportedly heard chanting “Salah is a bomber,” and three supporters were subsequently turned away from the Sinobo Stadium in the Czech capital after the video. The London club has also vowed to track down other fans in the video, which was condemned by both Chelsea and Liverpool. But Salah answered in the best possible way with his wonder goal on Sunday – which was not lost on social media users, who were full of praise for the man dubbed the Egyptian King as he netted his 19th league goal of the season. Moral of the story: don’t racially abuse Mo Salah. The strike gave title-chasing Liverpool a two-goal cushion as they went on to bank the three points needed to put them back at the top of the Premier League table, two points ahead of Manchester City, who have a game in hand. There were pumped-up celebrations from Liverpool boss Jurgen Klopp on the Anfield pitch after the game, as his team seek to end the club’s 29-year wait for a league title.